What’s the reason for a carbonfootprint? In 2008 TU/e committed itself to the MJA-3 covenant (multi-year agreements regarding energy efficiency) within the VSNU (Association of Universities in the Netherlands). This covenant lays down provisions for the reduction of the energy consumption by 30% in the period 2005-2020. Part of the covenant is a CO₂ reduction. 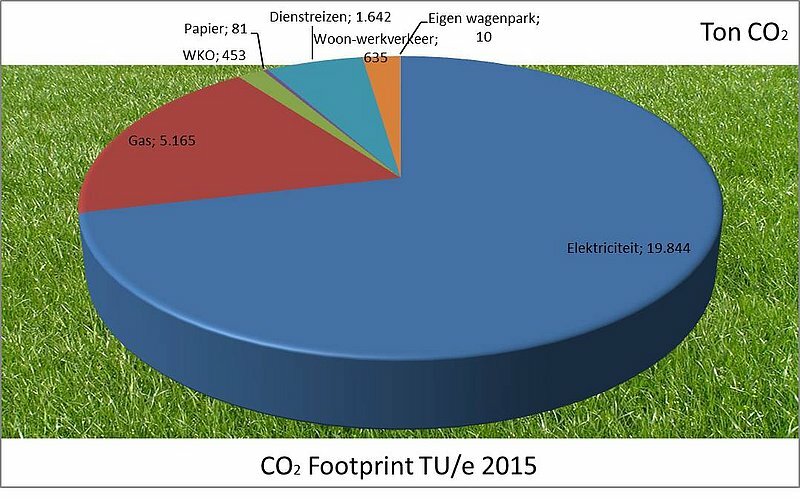 The first step towards this CO₂ reduction is to get a clear idea of the CO₂ emissions of TU/e. A carbon footprint is an inventory and identification of the main energy flows and a quantification of CO₂ emissions. The carbon footprint of TU/e shows how much CO₂ is emitted by TU/e, by its own staff members and within its own premises. Other buildings on campus and students and third parties are left out of consideration. We have decided to highlight the subject of mobility. In this context 2010 has been taken as the reference year, for at the time of the assessment this was the most recent year of which all data were available. The first carbon footprint is a baseline. The intention is to measure our CO₂ footprint regularly, so as to monitor and provide insight into our improvements. Click on the pictures for a review.